For Andrew, a passion for painting the natural world demonstrated itself at an early age. Growing up in rural Devon, he was drawn to studying wildlife, in particular birds of prey, which remain one of his favourite subject matters. He now resides in a village, situated in the Pennines to the north of Weardale where he draws huge inspiration from the uplands and Grouse moors on his doorstep. Whilst studying at Exeter College of Art and Design (1987-89), he won a British Association Shooting and Conservation competition for art, whilst also secured his first contract to illustrate Ranulf Raynor’s “The story of the sporting gun” at the tender age of 18. In 1991 Andrew held his first solo exhibition at the National Falconry fair, and has enjoyed much success exhibiting there regularly over subsequent years. It was also here that he met a number of major wildlife artists including Alan Hunt, who became a source of inspiration and guidance for his work. Several years later his paintings were featured in the very successful book; "Gyrfalcon" by Emma Ford, and most recently have been included in “The Flying of Falcons” by Ed Pitcher and Ricardo Velarde, which is set to become a modern classic. Another is “Peregrines of the World”, with contributing authors include Professor Tom Cade, Professor Clayton White and Jim Enderson. He has also been involved with publications about bird art including “Drawing and Painting Birds’ by Tim Wootton. 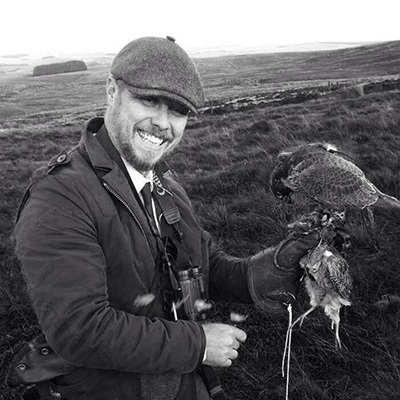 He has been a regular contributor on bird forums, and works closely with organisations such as IAF (International Association of Falconers), and BFC (British Falconer’s Club) to raise the awareness of Falconry around the world. Andrew’s work is collected worldwide and he has exhibited successfully in the Middle East, America and Europe. 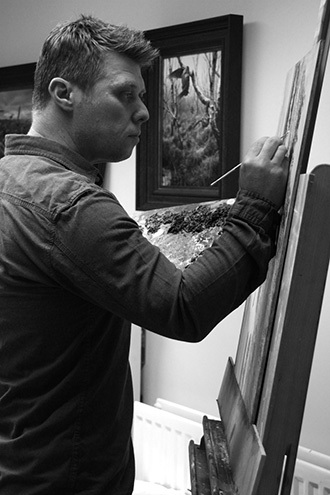 From 1997 to 2011, Andrew worked with the prestigious London based gallery, the Halcyon, situated in Mayfair, where he was featured in many of their high profile wildlife shows. In 2007 he had a very successful one-man show with them, where his work included Game birds and Middle-Eastern subjects. Some of his commissions have included portraiture for Royal families in the Middle East and heavy involvement in the redesign of the UAE emblem. He has also completed subject matter as varied as military scenes. At present Andrew has been primarily working on a commission basis and is currently working on a very large mural project which will form his largest piece of work he has done to date. Andrew still travels extensively for his artwork; North America, Africa, and the Middle East are just some of the key places that his work takes him. “I can remember vividly as a child standing in awe at the Swifts that passed over the tops of our heads in the playground. I dwelled in a bubble of fascination as these wonderful speedsters hurtled above. My piers ran around oblivious to these aerial travellers from Africa. I would run around too but I was the one who stopped, looked up, and drew what I saw. Maybe this is what it is to be an artist.